Hi everyone. 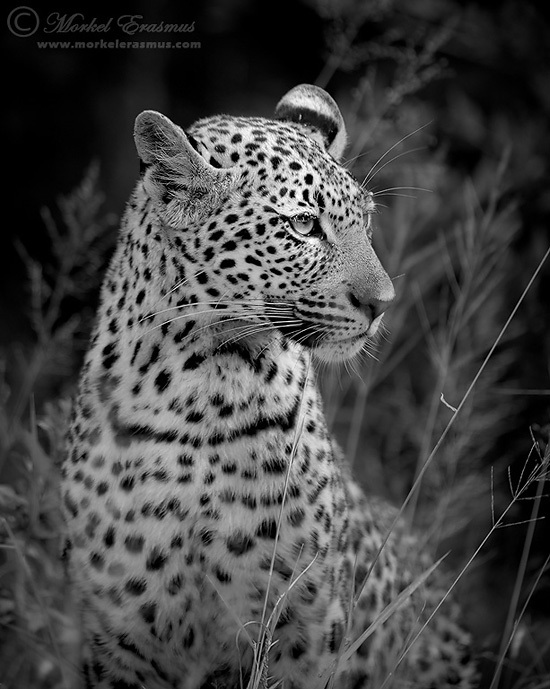 Here's another addition to my new African Visions series of wildlife in monochrome and duotone. A beautiful young leopard pauses and sits poised like only this graceful cat can. I think I have one of the poorest (read: least amount of photos) leopard portfolios of all the wildlife photographers I know. I just have bad luck with them! Aside from that one epic sighting in Kruger last year of the leopard scaling the tree, my other leopard sightings leave much to be desired. They avoid me in the Kalahari. They avoided me shockingly in Savute last year. And they even avoided me in the Sabi Sands earlier this year. This was taken in 2010 when leopards still liked me, LOL. Monochrome conversions are very personal and subjective. Contrary to popular belief, merely converting to black-and-white won't "save" a photo. I often shoot with monochrome in mind - trying to look for contrasts and textures to use. Getting a monochrome conversion just right often takes me longer than processing a normal "colour" photo. Have a great weekend, folks! I hope to meet some of you over the weekend at the Photo & Film Expo in Johannesburg, South Africa. Come and check out the Wild Eye stall (#339). This photo is Copyrighted © Morkel Erasmus Photography. Wonderful portrait of a regal animal.